XML, or Extensible Markup Language, is a data file that uses tags to define objects and object attributes. It is a general purpose specification that was developed to replace HTML in order to provide more structured documents. XML is a free open standard recommended by the World Wide Web Consortium (W3C). XML, which is derived from SGML (ISO 8879), is a simple and flexible text format that is easily read by humans and understood by machines. The format is very similar to HTML, except that it uses tags to define objects and data within the objects. In order for the document to be well formed there must be tags at both the ends. In other words, it must start with a tag (<>) and end with a tag (/). If either of the tags is missing the document is incomplete. As for the attributes within the tags, they must be enclosed in either single quotes or double quotes. If an element is empty, it must then be marked with a self-closing tag. There are several different techniques of processing XML files – these include using a programming language and SAX API or DOM API; or pull-parsing or in-situ parsing. XML files have a simple hierarchical structure allowing it to be applied on a wide range of applications – like databases, Java, e-commerce, web development, searching and so on. It is platform-independent, which makes it immune to technological changes. It also supports Unicode, which means that it allows communication in almost any human language. All these important features have made XML files a widely used means of storing and transferring data across programs and the Internet. 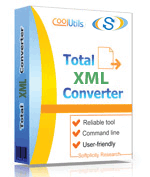 The XML files, which use the file extension ‘.xml’, can easily be opened and edited using any HTML or XML editor; or converted to CSV, JSON, XLS, PDF, HTML, ODS, TXT or other formats by Total XML Converter.